Try a few times to unlock your android phone until you are presented with a button to unlock the pattern as shown below. 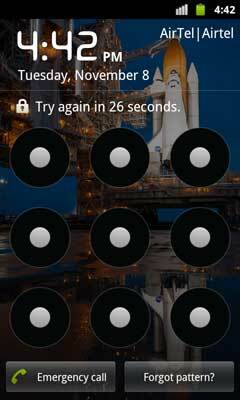 Now if you are successfully authorized, you will be presented a screen to set a new lock pattern. Put in a new pattern and confirm the pattern once. Now you should be at the home screen with your unlock pattern reset. Don't have a Google Account connected / No internet on your phone? The above steps are demonstrated on Google Nexus S, and it should work on similar phones like Galaxy S, Galaxy S2, HTC Desire, HTC Incredible, HTC Wildfire, LG Optimus, LG Optimus 2x. Try and let me know! I have a problem with my lg optimus 300 ,too many pattern attempts. i have a google account and password then i click sign in then after that you have incorrectly drawn your unlock pattern 5 times. please try again in 30 seconds then i click ok, then i cant see the pattern to make a new . I have a problem with my samsung galexy 2,too many pattern attempts. I have a gmail account and password but it does not work.